Helloooo! It's been a crazy week here on the East Coast and I'm so glad that it's Friday:) And I'm so happy to be sharing this card that I made with the new Avery Elle Ellie stamp! So cute, right? Thank you so much for stopping by! I hope everyone has a wonderful weekend! Adorable card, JJ, and I love your shaker element. So very clever! OK I definitely need to try out that fuse when we get together next, I love how you created the shaker at the edge, looks so cool! Once again my jaw dropped, JJ!!! This is so clever! I adore the absolutely adorable result! JJ I just love when crafters are so innovative! Perfectly executed and with such a cute card!! This is so cute!!! LOVE!!! How do you keep coming up with these amazing ideas??? Your one of my favourite designers and I always look forward to your posts as each one has something new to inspire and amaze me! Oh wow, this is SO amazing! This is genius!! Love it so much!! I absolutely love this and thanks for sharing that great technique! More tools to put on my list! I'm pinning this card! This is so super adorable and thank you for the video~!!!!!!!!!!!!! I saw this on Pinterest and I LOVE it! Wonderful, wonderful design .... thank you for the inspiring video!! Wow, that is just amazing, I'm going to watch your tutorial now on how you did the edge and the new tool you used! So cool and fun! I was wondering how you got the sequins to the edge for that super unique look. This is such a cute card!! Love that the elephant is trumpeting out sequins!! Thanks for showcasing the Fuse in your video!! Much appreciated! I am so glad you showed us the video since the first time I saw this awesome card on the AE blog I was like "How did she do that?!?!?!?". Аwesome! Thanks for the tutorial!! So adorable! Love this unique shaker card. Thanks for the tutorial. So Cute, JJ!!! Love your take on this innovative way to make a shaker card. Thanks, Paulette S. Genius!!! 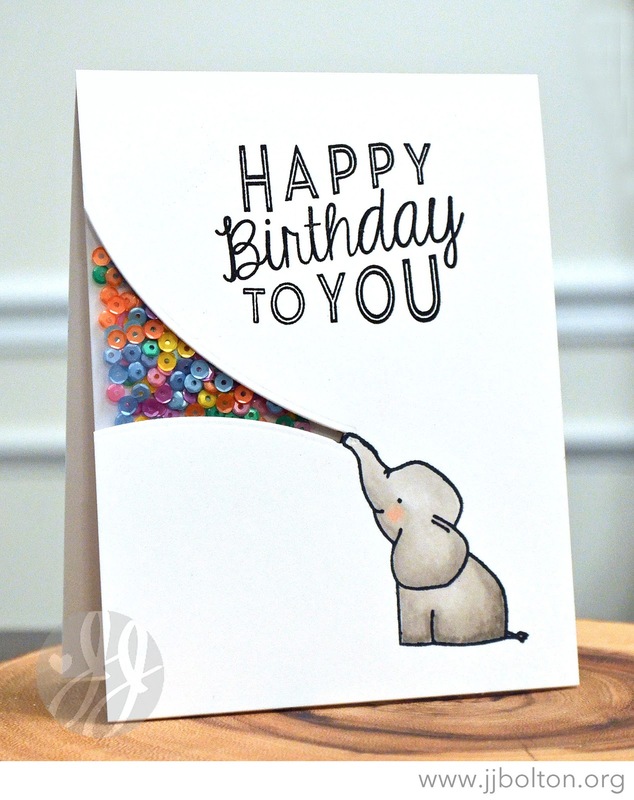 I just love how you created such a clever pocket for your shaker, JJ...such a darling card, too! Thank you so much for the video! That's a genius idea for a shaker card! What a creative card! I'm going to have to add the Fuse Tool to my collection now :) By the way, which company produces the birthday sentiment you used? Thanks! So fun and cute I need to try this - super cute - like that it's less bulky - probably uses less sequins too - only one bajillion instead of three !!! HAHAHA!! What an adorable card design! Thank you so much for sharing it! Such a cute card and EASY!! We have the stamp I was looking for an excuse to by the fuse tool! I love your cards! Thanks! Adorable! Where can I aquire the sentiment you stamped on this card? Love this card, what a great idea.